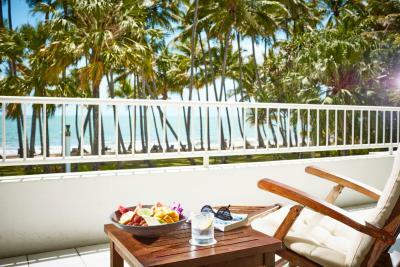 Lock in a great price for Alamanda Palm Cove by Lancemore – rated 9.1 by recent guests! Wonderfully roomy, clean. Need a bathroom downstairs. Service is really great and very helpful. 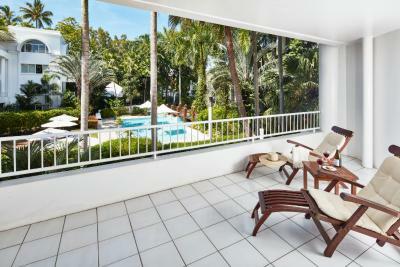 great location, near to the restaurant and the city centre. Clean living area and bathroom. Beautiful setting overlooking a gorgeous beach. Fabulous restaurant NuNu in the complex. Apartment had everything you could possibly need and was spacious. Daily cleaning team were fantastic and reception staff lovey and helpful. The apt was very large with a beautiful view from the balcony. The staff were extremely helpful and friendly. Had the best massage ever at the spa! We weren't told the apartment was double storey which would have affected us booking Resort but other than that everything was good except for musty smell in the ensuite shower its a really lovely friendly place to stay and the staff were excellent more than happy enjoyed our week here . Everything about our stay was fabulous! The apartment was huge, nicely laid out and furnished. And the staff were superb! Special thank you to Meghan, Sabrina and Bel. But truly everyone we came into contact with was excellent including Ty, the manager. There was confusion over the booking when I arrived. Booking made through Booking.com and I requested a ground floor apartment for my husband and myself as I need a double knee replacement. Upon arrival Alamanda had us all up stairs. Management and staff then went above and beyond the call of duty to rectify the mistake. After two days, we were relocated to a ground floor apartment. We couldn't be happier! 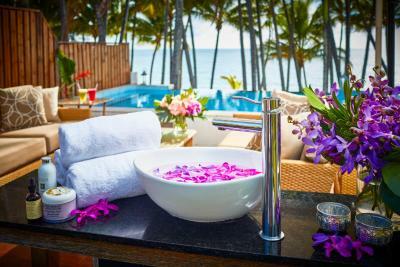 We were greeted immediately upon arrival and offered drinks and towels to refresh ourselves.The accommodation was spacious, clean and extremely comfortable. 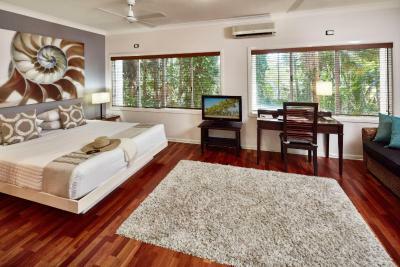 Staff serviced our room on a daily basis and were very friendly and accommodating. There were three pools to reside by or the beach. 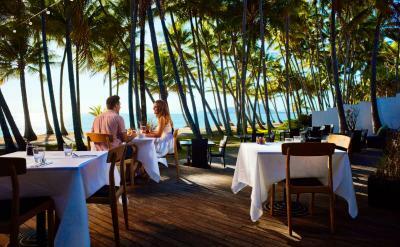 There are plenty of cafes and restaurants to choose from in the main strip and the food is of a very high standard. 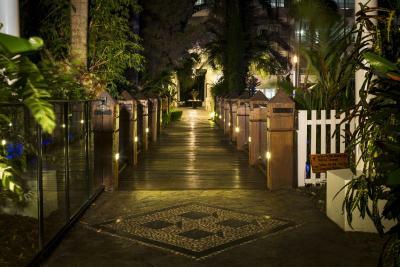 We dined at the resort's restaurant Nu Nu and had a delicious meal. 'We'll be back to Alamanda Resort. 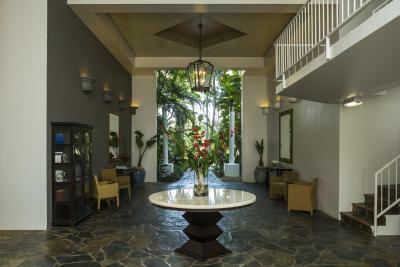 The room was very large and comfortable, staff were very freindly and helpful. 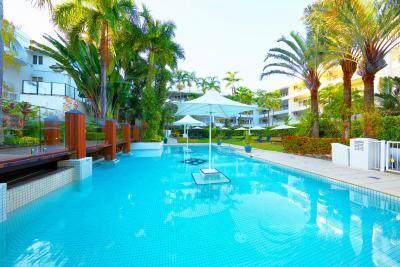 Alamanda Palm Cove by Lancemore This rating is a reflection of how the property compares to the industry standard when it comes to price, facilities and services available. It's based on a self-evaluation by the property. Use this rating to help choose your stay! 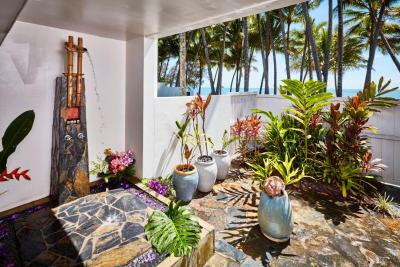 Overlooking the Coral Sea, Alamanda Palm Cove features 3 swimming pools, a day spa and a hot tub. 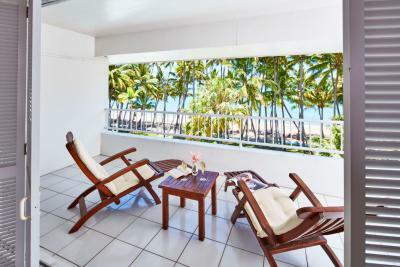 A private balcony with ocean or pool views is standard in all apartments. Free parking is available on site. 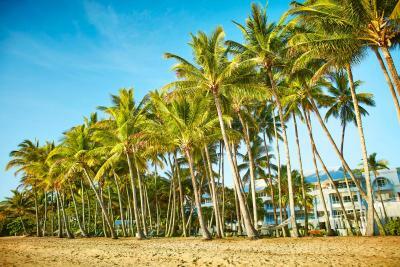 Alamanda Palm Cove is 30 minutes’ drive from Cairns International Airport and Kuranda Scenic Railway. 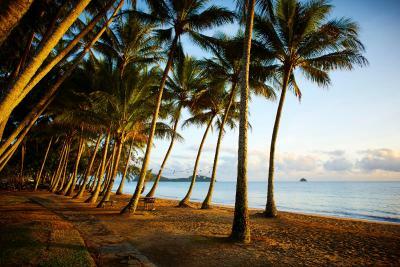 The Daintree Rainforest is a 1-hour drive away. 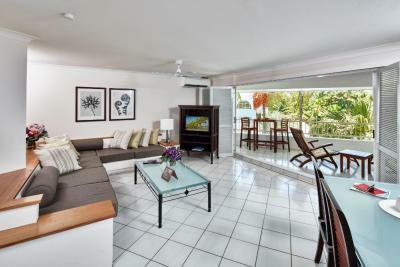 All air-conditioned apartments have laundry facilities and a kitchen with a dishwasher and microwave. Each apartment has a living room with cable TV and a DVD player. 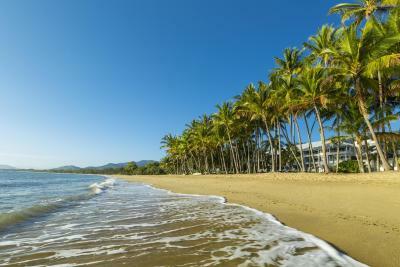 The tour desk can book trips to the Daintree Rainforest and the Great Barrier Reef. 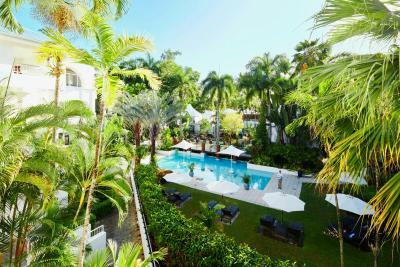 The resort also offers barbecue facilities, a 24-hour front desk and concierge services. The bar serves a wide range of beers, wines and cocktails. 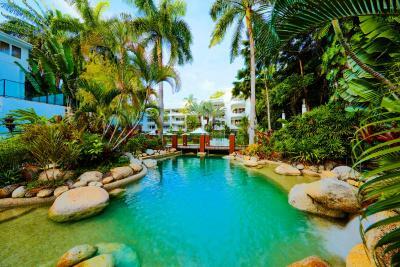 When would you like to stay at Alamanda Palm Cove by Lancemore? 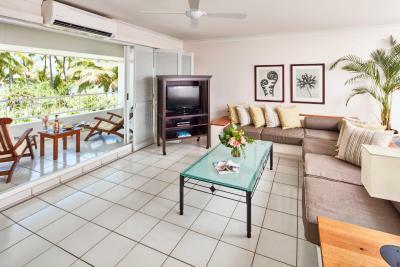 This air-conditioned apartment features a private balcony with pool views, full kitchen and laundry facilities, and a living room with cable TV and a DVD player. 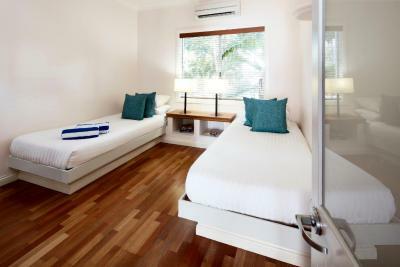 This air-conditioned apartment features a private balcony with pool views, 2 bathrooms, full kitchen and laundry facilities, and a living room with cable TV and a DVD player. 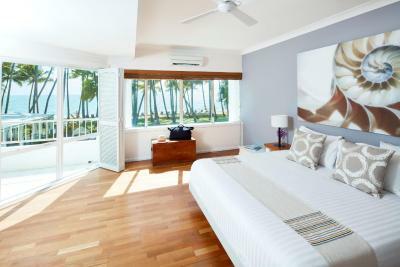 This air-conditioned apartment features a private balcony with Coral Sea views, full kitchen and laundry facilities, and a living room with cable TV and a DVD player. 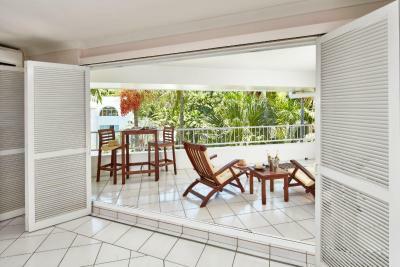 This air conditioned apartment features a private balcony with Coral Sea Views. 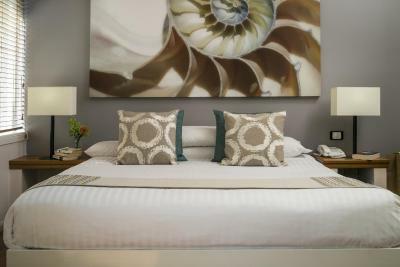 It features a fully equipped gourmet kitchen, two bathrooms, a private laundry, satellite TV, DVD player, personal safe, hairdryer and coffee and tea making facilities. 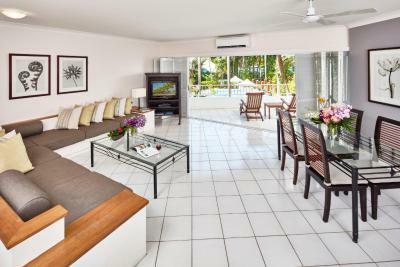 This spacious suite features a balcony with beach views, fully equipped kitchen, laundry, cable TV and tea/coffee making facilities. This spacious studio features a balcony with pool views, fully equipped kitchen, laundry, TV with satellite channels and tea/coffee making facilities. It also features a personal safe, air conditioning and a hairdryer. 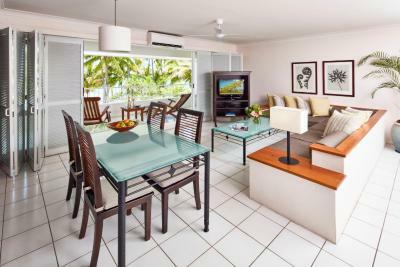 This apartment features a balcony, DVD player and dining area. Please note breakfast for 2 adults is included. Any additional guests will incur an additional daily breakfast charge. This apartment features a balcony, air conditioning and electric kettle. 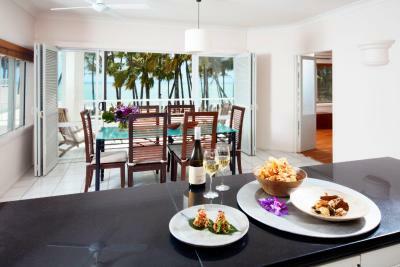 This suite has a balcony, sea view and dishwasher. This apartment features a balcony, dining area and oven. 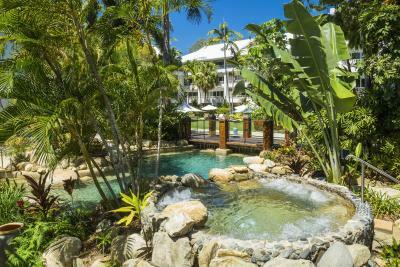 House Rules Alamanda Palm Cove by Lancemore takes special requests – add in the next step! 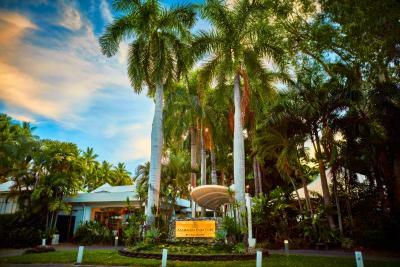 Alamanda Palm Cove by Lancemore accepts these cards and reserves the right to temporarily hold an amount prior to arrival. 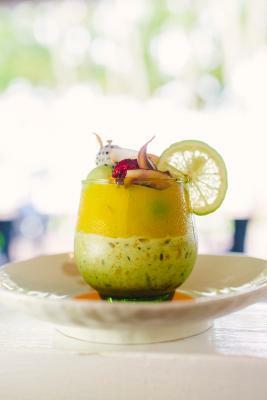 Please note that there is a 1.7% surcharge when you pay with a Visa or Mastercard credit card, and a 4% surcharge when you pay with an American Express or Diners Club credit card. Loved that they were so accommodating for people travelling with children / babies. I flew solo with my 1 year old and loved that I didn’t have to lug a cot and highchair through the airports. They were all set up and ready to go in the room when I arrived which was awesome with a tired baby. Beach view rooms were so lovely and spacious. The pools were amazing and proximity to restaurants including Nu Nu’s was fantastic. Spa was also lovely and very accommodating of last minute changes / requests. Love love loved it. The apartment was wonderfully spacious. Loved having separate bathrooms:) Great big bed! Excellent location, great views. No lifts or wheelchair access for clients that needs them! That’s a shame in this time and age! It was close to restaurants and very spacious! 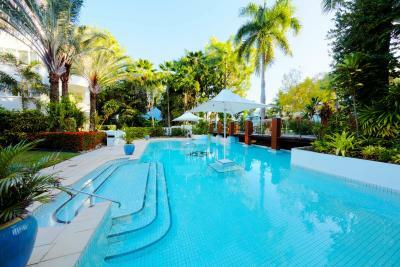 Lovely pool areas! Waiting area outside the reception! Lovely staff! We thought the staff were wonderful, very accommodating... especially Cedric. It was our wedding anniversary on the first night we stayed and we were treated beautifully, with a complimentary bottle of bubbles. The kids had the best time in the pools, making lots of new friends. Our apartment was huge and brilliant value for money. At this time of year it is not possible to swim in the ocean, however this does give another reason to head back when you can swim in the ocean! 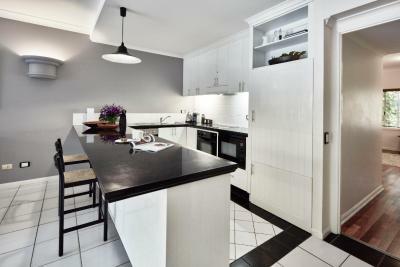 The property could do with a little TLC as it is gaining some years under its belt but still well maintained and comfortable. We were very lucky to be upgraded to a top floor, 3 bedroom, 2 level suite. The room was also on the corner of the main building, furthest away from the reception area so it was very private and had amazing views of the beach. Bed was very comfy and we had 3 balconies in total but the undercover balcony was a great spot for an end of day G&T and wine while sitting back in the deck chair admiring the view and listening to the waves. NUNU was fantastic and highly recommend a meal. 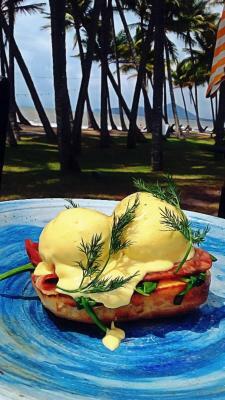 Palm Cove also has many other places for great food and drinks. We stayed here for 3 nights, expecting a wifi. there is, but it is very slow. The bed is not the comfiest, the bedside lamp is very dusty. A lot of ants, im not sure about this and i dont think is the property to blame. but yes, better be careful with your food if u left it out. Unfortunately, we can not swim at the beach, is pretty dangerous there might be sea crocodile present, and it is stinger season at this time. 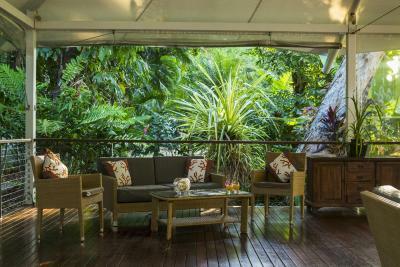 Fantastic stay in a beautiful comfortable suite, and eating at their NuNu restaurant was an absolute highlight. The staff couldn't have been more friendly, welcoming or helpful. 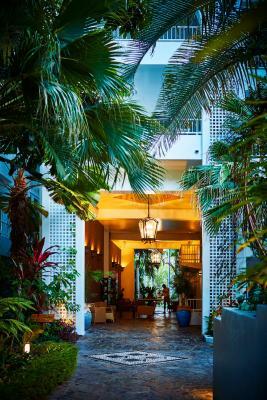 Allamanda Palm Cove is always spectacular. Staff were outstanding. Facilities and location fantastic. Adults’ pool and sunlounges on the beach were an awesome bonus. We’ll be back.